We are very excited to share that our seeds are beginning to sprout! 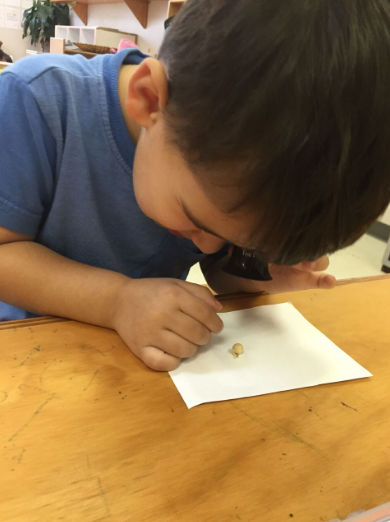 This week we wanted to check on the progress of our seeds, so we brought out magnifying glasses to take a closer look. After everyone got the chance to see the sprouting of the seeds, we all sat down and discussed what we saw. The children primarily focused on the shape and the texture of what they viewed, revealing an interest and understanding of basic geometric and sensory concepts. 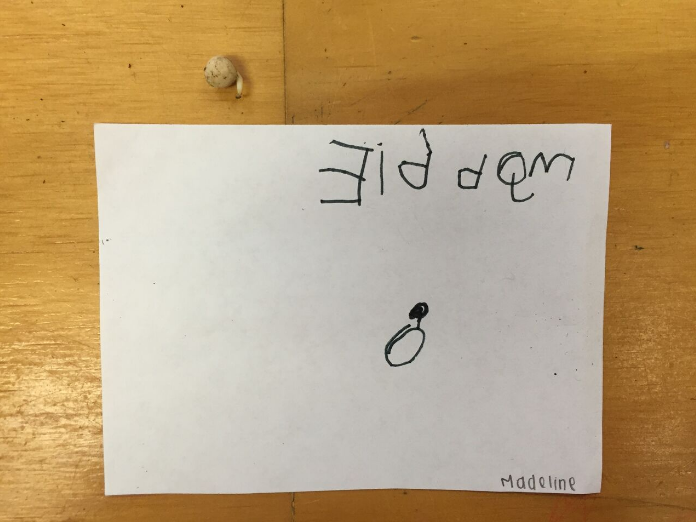 One of the children described their experience with the magnifying glass, saying, “When I bring it really close to my eye I can see the stem, and the leaves inside of the seeds.” This group conversation built upon the children’s interpersonal skills and provided positive reinforcement of personal ideas. At the end of the discussion the children sat and documented their observations by drawing a picture of what they saw. Putting their observations down on paper allowed the children to work on fine motor skills. 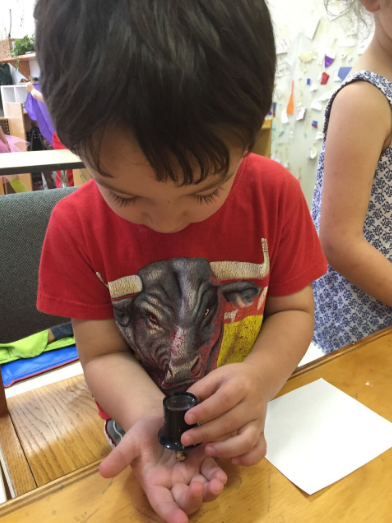 It also allowed them to engage in mimicking and modeling, which are both important ways in which children learn about the world around them. Drawing what they saw required a great amount of attention to detail and careful observation, while also allowing each child to express his or her personal perspective of the experience. This exploration introduced the children to a new and very cool tool: a magnifying glass. More importantly, it introduced them to a brand new side of the plant that they would not have seen otherwise. The children were able to get up close and personal with an important aspect of the plant growing process, while engaging their sense of sight in an exciting way. Understanding the science behind plant growth evokes an interest in and appreciation of the natural world, showing children that the environment is an exciting place that should be cared for. By caring for the plants daily, the children have obtained a sense of responsibility. Getting to see the positive results of their actions first hand is very rewarding and comes with a great sense of accomplishment.